©1998 Newfoundland and Labrador Heritage Web Site Project. Detailed descriptions from the 1620s provide what is probably a fairly accurate floor plan of the original structure. It consisted of three rooms: an entry of 1.8 metres (6 feet), a hall of 5.5 metres (18 feet) and a cellar of 6.1 metres (20 feet). A kitchen room, walled up with stone, was connected by "convenient passages" and measured 3.6 x 5.5 metres (11.8 x 18 feet). A 3.6 x 4.2 metre (11.8 x 13.8 feet) parlor was added within a year. Although we might expect additions and reorganizations over the 75 years that the house stood, it seems likely that archaeologists will be able to identify structures as they are exposed. A clue to its location is given by the street that runs through the village and the location of the forge. All of the original buildings, including the Mansion House, would have stood on the south side of the street; the artificially-filled land to the north had not been created in 1621. It also stands to reason that, since the forge is located on the western end of the street, the principal residence would have been built at the opposite end. This now appears to be precisely what was done. Only a few metres inside the eastern rampart and ditch archaeologists have found a portion of the remains of a fireplace, a deep cobble-lined pit that might once have been a part of the cellar, and a slate-lined drain that may lead to a cesspit not far from the structure. Since almost all of the house lies beneath an existing road, archaeologists may never be able to expose the entire dwelling and compare it with the dimensions provided by early chroniclers. The presence of this glass in the Kirke house midden indicates the upper-class nature of the dwelling. What appears to be a scratched inscription near the center is indecipherable. 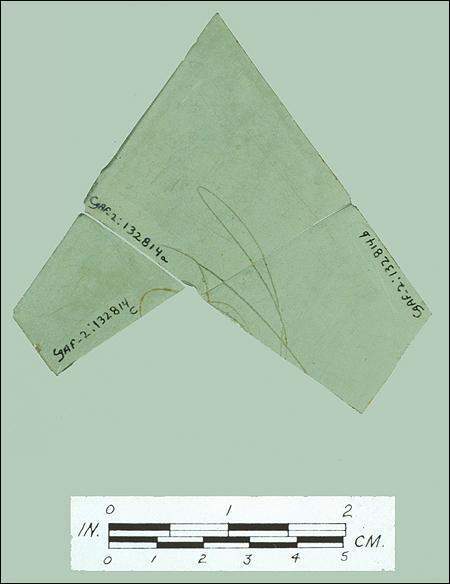 The numbers along the edges of the glass were place there by the Ferryland archaeology team for the purpose of cataloguing and documenting the artifact. 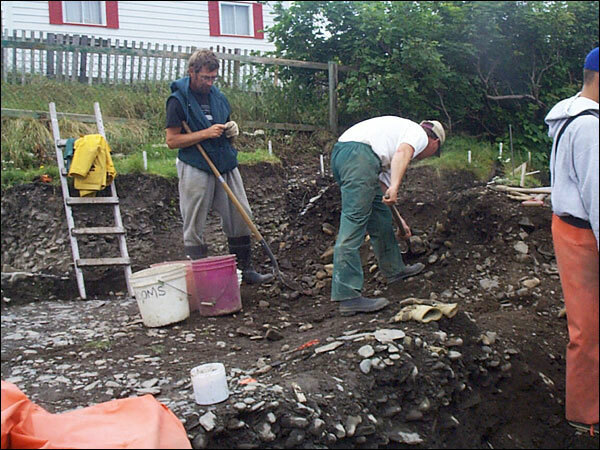 However, a large midden just north of the house has produced an astounding collection of artifacts that indicate beyond a doubt that the adjacent house was occupied by members of the Ferryland gentry. Among these objects are window glass, expensive tin-glazed and terra sigillata ceramics, silver bodkins, pins and a silver thimble, gilt beads, gilt cuff links and other decorative artifacts and gold- and silver-plated spurs. Individually, none of these items would be expected to form part of the contents of a fisher's house; collectively they speak unmistakably of an upper-class family. 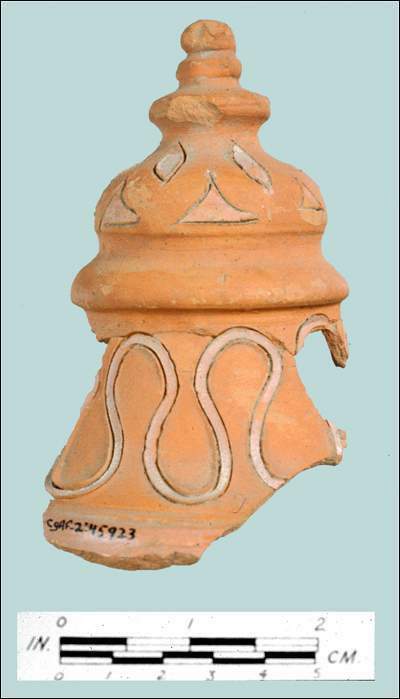 Decorated Finial from an Elaborate Terra Sigillata Vessel. 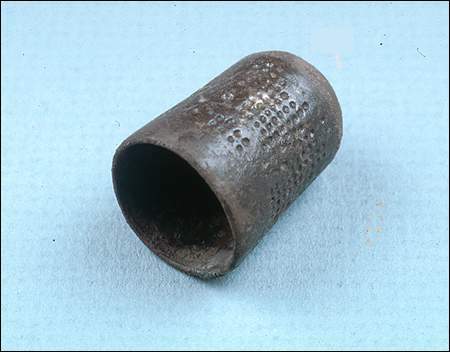 Among the artifacts were the bowls of several tobacco pipes of a style manufactured in the Chesapeake region during the mid-1600s. These pipes are of particular interest, for they bear the letters "DK," almost certainly the monogram of Sir David Kirke. The Kirkes therefore must have occupied the house during most of the time the rich midden was created. Finally, we know that the Kirke family dispossessed Calvert's representative from the Mansion House in 1638 and appropriated the dwelling as their own residence. The obvious conclusion, therefore, is that the scant remains of the dwelling covered by an existing road are those of one of the most interesting structures at Ferryland. Whether or not this is actually the case, however, awaits new discoveries in coming years.